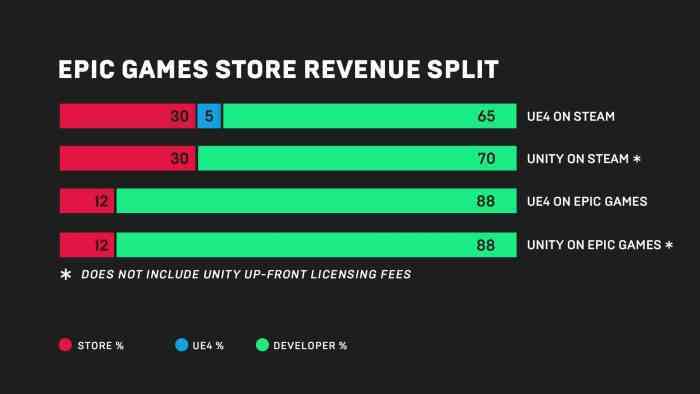 Epic Games will soon launch its own digital retail store for PC and Mac games and developers that distribute their games on this platform will receive a 88 percent of their game’s revenue while Epic Games receives 12 percent, according to an announcement today. With Steam’s current policy of raking in 20 to 30 percent of the revenue created by games that are featured on its platform, this upcoming online store could prove to be a significant rival. This online store will also have the “Support-A-Creator” program which allows developers to connect “with over 10,000 creators” such as YouTubers or Twitch streamers. Content creators who join the program and promote the games of developers involved in this program will be rewarded with money when the supporters of those content creators buy things on the Epic Games store or use V-Bucks in Fortnite, according to an official FAQ. Also, according to The Verge, Epic Games CEO Tim Sweeney is open to expanding the store to Android and iOS. Additional info about future releases that will be featured on the store will be revealed later this week on Thursday during The Game Awards. What do you think about this news? Let us know your thoughts in the comments section below.